Iron-Clad Ships, Or Armored Ships, vessels covered or plated with iron for the purpose of rendering them impenetrable to the fire of artillery. The idea of strengthening the sides of ships so as to enable them to resist attack is nearly as old as the art of navigation itself. From the time of the Norman freebooters, who protected themselves by ranging their bucklers along the sides of their vessels, down to the battle between the Kearsarge and the Alabama in 1864, in which the sides of the former were protected by hanging chains over the bulwarks, and from the time of the Romans, who built their triremes with castellated prows, to the English, who have covered their frigates with plates of solid iron, all nations have sought by means more or less perfect to make their ships impenetrable, and to render them invincible in battle. The first attempts at making iron-clad vessels were made by the Normans in the 12th century, who put an armature or belt of iron around their vessels, just above the water line; this belt terminated in front by a spur. In some instances this armature was converted into a curtain of iron or brass reaching above the bulwarks for the protection of the combatants. The crusaders of the 12th and 13th centuries protected their ships in a similar manner. Pedro of Aragon in 1354 ordered the sides of his ships to be covered with leather or raw hide to protect them against incendiary compounds. Andrea Doria, who commanded in the expedition against Tunis in 1535, had one vessel plated with lead in his fleet, furnished by the knights of St. John of Jerusalem; and at the battle of Lepanto (1571) many of the Genoese ships were strengthened by blindages or bulwarks composed of heavy beams, old sails, cordage, etc. In 1782 the chevalier d'Argon, on the suggestion of M. de Verdun, at the unsuccessful siege of Gibraltar, constructed and used 10 floating batteries having their tops bomb-proof, and the sides protected by parapets 6 ft. thick, composed of hard wood reenforced by cork wood, leather, and bars of iron. These floating batteries carried 214 guns of large calibre, of which 72 were reserves, and for several hours at close range withstood the heavy fire of artillery concentrated upon them. They yielded finally only to red-hot shot, and all but one were burnt or blown up. In 1814, toward the end of the war with England and after the success of the first steamboats, Robert Fulton proposed to construct a floating battery for the United States government, capable of steaming five or six miles per hour, and having walls proof against the heaviest artillery. The hope of breaking the blockade of the Hudson and Chesapeake caused this proposition to be received with enthusiasm. The vessel was begun in June and launched in October of the same year; but owing to delays in completing her machinery, she was not ready for service till June, 1815, after the declaration of peace. This battery, called the Demologos, was 150 ft. long, and was composed of two hulls coupled together, but separated by an open space 13 ft. wide. The wheel was placed between the two hulls. The battery and machinery were protected by a wooden wall about 6 ft. thick and extending 3 ft. below the water line. The armament consisted of 30 32-pdr. guns. The speed of the vessel reached nearly six knots per hour. Her name was changed to the Fulton after the death of that distinguished engineer. This vessel seems to have been far ahead of her time, and, although never used in warfare, was doubtless superior to anything of the kind ever built up to that day. She was destroyed by the explosion of her magazine in 1829. In 1838 the Fulton II. was constructed, but with improved engines and greater speed. She was a true side-wheel steamer, and her wooden walls are said to have been covered with a thin plating of iron. - In 1826 an anonymous writer in Paris proposed the construction of iron or iron-clad frigates, the walls of which should have a thickness sufficient to resist cannon shot, asserting that when the enemy should have adapted the Paixhans system of horizontal shell firing wooden ships would no longer serve for the purposes of war. This was a correct idea, but only an idea at that time; and it is nearly impossible to find the real inventor of iron-plated ships, or ironclads, as they are now commonly called. The idea was public property and the natural outgrowth of the improvements made in artillery; the inventors were those of all nations who gave the idea form and feasibility. The remarkable results obtained by the employment of Paix-hans's system of artillery called the attention of all nations to the means of defending both ships and land batteries from the destructive effect of horizontal shell firing. Some experiments were made in 1834 at Metz and Gavres for the purpose of determining the power of different materials to resist penetration, in consequence of which Gen. Paixhans recommended that the French vessels of war should be strengthened by plating them with iron; but this was rejected by the board of naval construction in 1841. In 1835 Mr. John Podd Drake proposed to the English naval department the protection of the machinery of steam men-of-war by iron plating 4 1/2 in. thick, and in 1841 he promulgated the idea of iron-clad blockading ships. - In 1842 Robert L. Stevens of Hoboken, N. J., proposed to the United States government the construction of ironclad steam batteries for the purpose of defending the commercial ports from the chances of bombardment by hostile fleets. After recognizing the importance of this idea, the government decided to make a series of experiments with the view of determining the best arrangement for the walls of such batteries. 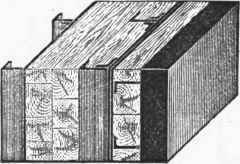 These experiments demonstrated that an iron wall 4 1/2 in. thick was sufficient to resist the largest projectiles then in use. The construction of one battery was decided upon, but it was not commenced till 1854. From the best information which can be obtained, her length over all is 420 ft., her breadth 52 ft., depth from fighting deck 28 ft., draught of water with coal and stores on board 20 ft. 6 in., fighting draught 22 ft. 6 in. The vessel is an iron screw steamer, secured by longitudinal bulkheads, by a heavy box keelson running from stem to stern, and by shot-proof decks and continuous side armor. She has two screw propellers working independently, each being driven by four compact beam engines working entirely below the water line. Cylinders are 3 ft. 9 in., with 3 ft. 6 in. stroke, driven by 10 boilers and capable of developing 8,600 horse power. The leading principles of this vessel's construction are as follows: 1. When ready for action the ship is to be settled 2 ft. lower in the water, by letting water into compartments which can again be emptied rapidly by powerful steam pumps provided for that purpose; this is done in order to save the weight and cost of the additional armor which would otherwise be necessary; to allow a flatter slope and secure greater resistance of the armor; to employ the resistance of the water; to give the vessel a greater speed by expelling the water from her compartments, and to enable her when thus lightened to enter harbors into which she could otherwise not go. 2. The use of inclined instead of vertical plating, for the purpose of changing the direction and throwing off instead of stopping the enemy's projectiles. The side plating consists of the best iron slabs 3 1/2 in. 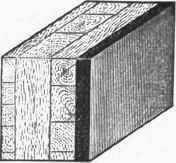 thick, laid upon a triangular backing of locust timber extending outside the shell of the vessel from stem to stern, and to a depth of 4 ft. below the water line when the vessel is ready for action. From the outer edge of this side protection the shot-proof casemate or main armor proceeds, upward and inward, at an angle of one vertical to two horizontal, to a height of 28 ft. from the bottom of the ship, and 5 1/2 ft. from the fighting line, where it is covered by a flat shot-proof deck. The main armor extends only over the engine's boilers, blowing and pumping machinery, that is, 107 ft. forward and 74 ft. aft the centre. Its ends slope upward and inward at a similar angle, from the 21-foot deck, which is shot-proof, and which extends forward and aft the armor to the extreme bow and stern. The inclined armor, or casemate, is composed of 6| in. of iron plates, backed by 14 in. 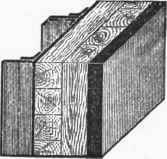 of locust timber, in which are imbedded six-inch wrought-iron girders 2 ft. apart. The whole is lined with half-inch plate iron. It is supported by the engine frames, by heavy braces and girders between the boilers, and by the frames and sides of the ship. The horizontal shot-proof decks are composed of 1 1/2 in. of iron plates, resting on six-inch wrought-iron girders, filled in with locust timber and backed with half-inch iron plate. The guns will be loaded by being pivoted to a hole in the deck protected by a shot-proof hood, below which is a steam cylinder of which the piston rod is the ramrod of the gun. All the machinery and men for working the guns are thus within the shot-proof armor. The guns are protected by a covering of wrought-iron armor in addition to their own immense thickness, and will be trained by steam power. The shot-proof deck fore and aft the central casemate affords ample accommodation for men and officers. Above this deck, and flush with the 28-foot gun deck, which forms the top of the casemate, is a light deck, extending at the sides of the casemate, and forward and aft from stem to stern. The entire 28-foot or gun deck is thus level (excepting the usual camber), and unencumbered over the whole vessel. Only the part of it that forms the top of the casemate is shot-proof. Above the 28-foot deck are flying bulwarks to be turned down in time of action. The height of the bulwarks from the water at the load line will be 13 1/2 ft. The 14-foot deck affords ample space for stores, and for the salt-water tanks designed for settling the vessel to the fighting line. Below the 14-foot deck, forward of the boilers, are the blowers and pumping engines and coal bunkers. Abaft the engines are coal bunkers also. Capacity for coal, 1,000 tons. The vessel will have two light masts for emergencies, but will not ordinarily carry sails. Her projector claimed that her iron casemate, 6 3/4 in. thick backed by 14 in. 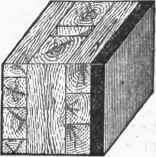 of hard timber, and standing at the acute angle of one base to two perpendicular, is a stronger protection than has ever been applied, and that at the same time it is comparatively light, as its extent is reduced by confining it to the central part of the vessel, and by immersing the vessel to a deeper fighting draught. The parts of the vessel fore and aft the central casemate are also thoroughly protected by a horizontal deck, which is not only shot-proof but one foot below the fighting water line. The water protection, as far as it can be judiciously employed, is at once the most perfect and cheapest armor. 3. The side protection, extending from stem to stern, is intended to answer these four important purposes: 1, protection from projectiles; 2, from disaster by collision; 3, increasing the immersed beam, and the consequent stability of the ship when fighting; 4, adding in a very great degree to the horizontal and vertical strength and stiffness of the vessel. 4. The immense power of the engines and the fine lines are intended to give a much higher speed than has been attained by any sea-going war or commercial steamer. The sharpness of her lines is unprecedented in any government practice, and in any except the latest and most successful commercial practice. 5. The ability of the vessel to turn rapidly round on her own centre, without making headway, by means of two screws, instead of occupying the time and making the circuit required by all other war vessels, it is thought, will give her remarkable and important facilities for manoeuvring when in action. 6. The employment of barbette guns, or on the top of the casemate instead of within it, gives the free range of the entire horizon. Three guns can be fired at a time in line with the keel, forward or aft. 7. As there is no casemate over the guns, the enemy cannot pour shot and shell into port holes at close quarters; for the same reason the guns will not be limited to the few degrees of range permitted by the ports, but can sweep the horizon. The cost and weight of the casemates over the guns are dispensed with, and the seven guns thus arranged will be as formidable as a whole broadside arranged in the ordinary way. This vessel was still incomplete when it was announced to be sold by auction on Oct. 2,1874, by the state of New Jersey, to which it was bequeathed by Mr. E. A. Stevens. - The experiments of the American government to test the theories of Mr. Stevens were repeated by the English admiralty at Woolwich. A target was constructed of 14 thicknesses of sheet iron, or about 2 1/2 in., riveted together and backed by 2 ft. of oak. It was fired at with 64- and 32-pdr. guns, at a distance of 375 yards; 32 projectiles were used, 8 of which broke the plating, but none of which succeeded in piercing the target. A new series of experiments was made in France in 1843 and 1844, at the request of the prince de Joinville; and in 1845 M. Dupuy de Lome published a memoir urging the construction of iron-plated frigates, having thinner plating than it was generally thought experiment had shown to be necessary, but carrying fewer guns of heavier calibre. The experiments up to that time had not indicated clearly enough the manner of constructing the walls of ships, and as Dupuy de Lome's memoir demanded still further experiments, the construction of ironclads was not yet undertaken. In 1846 the English admiralty made further experiments with 32-pdr. guns at 200 yards, against targets composed of iron plates riveted together. The results were thought to be unfavorable, and no further steps were taken at that time toward the employment of iron in the construction of ships of war. 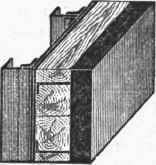 In 1847 M. Gervaize proposed a screw ship composed entirely of iron, and, basing his opinions on the experiments undertaken at Gavres in 1843-'5, he asserted that the impenetrability of iron walls is as much greater than that of wood, as the penetrating power of solid shot is greater than that of shell, and that consequently the true machine for naval warfare is the iron ship. He also claimed the possibility of using such vessels as rams, owing to their superior swiftness and solidity. These ideas were also put aside for the time being, and further experiments were undertaken, without any notable results till active operations in the war of England and France against Russia had taken place in 1854. It was then found that the English and French war ships drew too much water to get within close range of the forts in the Baltic, and hence it became necessary to construct vessels of lighter draught and greater force. The emperor of the French authorized M. Guieysse to make such further experiments as might be found necessary in deciding upon the plan. 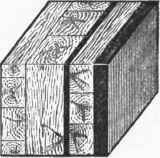 These were made at Vincennes, and resulted in a determination to lay the iron plates on an elastic backing of wood, and to have the plates rolled to the required thickness rather than composed of thin plates united together. The plans of Guieysse were adopted, and five floating batteries, the Devastation, Tonnante, Lave, Foudroyante, and Congreve, were begun. They were 160 ft. long at the water line, 42 ft. wide, and 8 ft. draught. Their armament consisted of 16 50-pdr. guns under the cuirasse and 2 12-pdrs. on the forecastle; the plating was composed of 4 1/2 in. of iron backed by 8 in. of oak. The engines were of 225 horse power, with boilers designed to act under a pressure of 75 lbs. to the square inch. The first of these vessels was launched in March, 1855, and the rest soon after. At the same time that, the order for these vessels was given the French minister of marine, M. Ducos, sent the plans to the English government; but Sir James Graham, the first lord of the admiralty, hesitated much before deciding to build any of this new class of ships. As a preliminary measure the experiments made at Vincennes were tested at Portsmouth in September, 1854, in the presence of Gamier and Guieysse. The results were satisfactory, and on Oct. 3 the admiralty ordered the construction of five batteries of the new type. Although they were sea-going vessels, they were without claims as ships, being designed simply for strong floating batteries. The French vessels of this class were towed to the Baltic by the screw frigates. On Oct. 17 the Lave, Tonnante, and Devastation attacked the fortress of Kinburn at close range, and, although they were hit many times, succeeded after five hours and a quarter in silencing the enemy's guns. The performances of these vessels left no doubt as to the utility or soundness of the idea on which they had been constructed, and at once attracted the attention of naval constructors throughout the world to the necessity not only of vessels of this class for harbor defence and attack, but also of having iron-clad cruisers and rams of high speed and fine sea-going qualities. The French themselves were the first to profit by their own experience, and at Toulon on March 4, 1858, under the orders of Napoleon III., began the construction of the Gloire, an iron-plated screw frigate of the first class. Her form does not essentially differ from that of the ordinary wooden frigates of the French navy, although, as she is also intended to act as a ram, her bows have a peculiar form specially designed for crushing the sides of her opponents. Her length over all is 250 ft., breadth of beam 55 ft.; her armament consists of 36 guns of 6.3 in. calibre. Her armor, which covers only her sides amidships, consists of solid plates 4 1/2 in. thick, backed by 2 ft. of timber. The completion of this ship marks an epoch of the greatest importance in naval warfare and architecture. From that day wooden ships gave way to a new class practically impenetrable to the projectiles of artillery, and endowed with speed and sea-going qualities equal to those of the vessels they were destined to replace. The science of ordnance and gunnery also received a new impulse, as guns of larger calibre and greater penetrating power became necessary. Every subsequent improvement in the construction of iron-clad ships has been followed if not preceded by a corresponding improvement in artillery, and in no branch of human industry have greater ingenuity or more persistent efforts been displayed. Shortly after the Gloire was begun, the French laid the keels of the Normandie and the Invincible on the same plans, and the Couronne on the plans suggested by M. Audinet. The construction of these ships was looked upon by all maritime nations as betraying an intention on the part of Napoleon III. to make France the principal naval power of the world, and was regarded by the English as a direct challenge which could only be properly met by the construction of a fleet of still more formidable vessels. Accordingly the admiralty ordered the building of the Warrior, and shortly afterward of the Black Prince, Defence, and Queen. These vessels were the forerunners of a new fleet composed entirely of ironclads, built at an enormous cost, but making good her position as the first naval power of the world. The plating of the Warrior, like that of the Gloire, is only 4 1/2 in. thick, and is applied amidships only. It is backed by 18 in. of teak, and is of uniform thickness, designed to resist 68-pdr. shot and shell. She is a long, handsome frigate, masted and rigged as usual, and sails faster than the Gloire, but owing to her greater length is not so handy at sea. The Defence and the Resistance, constructed upon the same plan, but smaller, soon followed. About the same time the French built the Magenta and the Solferino, admirable vessels, but as war ships in some respects less effective than the Gloire. The example of France and England was soon followed by the second-class naval powers. Austria undertook the construction of two frigates and Italy of two corvettes in 1860. - Up to this time all the efforts of constructors had been directed to the building of vessels after the old patterns, simply using iron instead of wood, or in order to strengthen the wooden walls of old ships, without any essential modification of form or change of model. The outbreak of the civil war in the United States gave a great impulse to invention in this direction. The seizure of the important points on the Mississippi river below Cairo enabled the confederates to erect batteries and to stop navigation, and rendered it necessary for the Union fleets to be accompanied by ironclads. The first of these were constructed by James B. Eads, a civil engineer residing in St. Louis. He built the St. Louis, Carondelet, Cairo, Mound City, Louisville, Cincinnati, and Pittsburgh in 1861, and later the Benton upon the model known subsequently as the "turtle-back." They were plated with iron slabs 2 1/2 in. thick and 11 in. wide, rabbeted together and laid on a 4-inch backing of oak inclined at an angle of about 45°, and each armed with 13 9- and 10-inch guns. These vessels were built under the orders of the war department, and were the first ironclads actually employed in warfare by the United States. While they were not impenetrable to the fire of heavy rifles, or even to the 8- and 10-inch columbiads used by the confederates, they did excellent service till the end of the war. Mr. Eads designed and constructed the Osage and the Neosho after the model of the Monitor, each having a turret carrying two 11-inch guns. The turret plating was 6 in. thick, the hull plating 2 1/2 in., the deck plating 1 in., while the draught of water was only 4 ft. They were 145 ft. long and 45 ft. wide. He also designed the Winnebago, the Milwaukee, the Chickasaw, and the Kick-apoo, each carrying two turrets, the sides of which were 8 in. thick, with hull plating 3 in. thick, and deck plating 1 1/2 in. They were each 226 ft. long, 56 ft. wide, and drew only 6 ft. Each turret carried two 11-inch guns. - The confederates, shortly after the commencement of hostilities, seized the navy yard at Norfolk, in the harbor of which the wooden frigate Merrimack had been scuttled and sunk. They raised her, cut down her sides, and converted her into an iron-clad ram, which they called the Virginia. She was covered with railroad iron, laid on in' an oak backing inclined at about 45° to the water surface. She was armed with 10 9- and 10-inch guns, and on March 8, 1862, sallied out upon the shipping in Hampton Roads, sinking the frigate Cumberland by ramming, and subsequently destroying the Congress. On the 9th she resumed operations, and after a contest with the frigate Minnesota was met by the Monitor, a novel ship constructed by John Ericsson of New York, which after a brief but remarkable combat disabled and drove the Virginia back to Norfolk. This combat marks one of the most notable epochs in naval warfare, and changed the course of naval construction throughout the world. The essential feature of this vessel was a revolving turret, composed of wrought-iron plates an inch thick, bolted together till a thickness of 8 in. had been obtained. The turret was 20 ft. in diameter and 9 ft. high; it contained two 11-inch Dahlgren guns, trained side by side and revolving with the turret, and throwing solid shot weighing 166 lbs., with a charge of 15 lbs. of powder. The hull of the vessel itself was of iron, 127 ft. long, 36 ft. 2 in. wide, and 12 ft. • depth of hold. Her extreme length over all was 173 ft., extreme width 41 ft. 6 in. She had a very low freeboard, and sat so deep in the water that she seemed submerged. She was built at Green-point (Brooklyn), N. Y., in 100 days, and cost $275,000. The plan upon which she was built is known as the turreted or monitor system, and was invented by Theodore R. Timby of Dutchess co., N. Y. The essential part of the plan was conceived when he was a boy, and the germ of the whole invention was embodied in a model which he completed in 1841. On Jan. 18, 1843, he filed his first caveat for the invention in the United States patent office. His specifications were "for a revolving metallic tower, and for a revolving tower for a floating battery to be propelled by steam." In the same year he completed and exhibited an iron model showing all the essential parts of the system as subsequently adopted, and still later another, which he presented to the emperor of China through Mr. Caleb Cushing, the American minister. In 1848 a committee of congress made a favorable report to the secretary of war upon the system. This was several years previous to the time when Capt. Coles of the English navy claimed to have invented the turret. When the civil war broke out Mr. Timby constructed a fifth model of his invention, embodying all the improvements which he had made. His patents covered the broad claim "for a revolving tower for offensive and defensive warfare, whether used on land or water." When therefore the monitors were to be built, the constructors at once recognized the validity of his claim, and paid him a liberal sum for the right to use his invention. Fig. 7 presents the section of a naval tower designed by Mr. Timby. It is supposed to be 40 ft. in diameter, with space for six guns. Revolving once a minute, its capacity would be one shot aimed at any given point every ten seconds. Thus it seems to be clear that the idea upon which the monitor system is based was invented and first presented to public notice by Mr. Timby; but it remained for Ericsson to give it practical application in this country, and Capt. Coles in England, although the latter did not at first propose to use revolving turrets. - The results of the combat in Hampton Roads were far-reaching in effect; they demonstrated not only the destructive power and practical invulnerability of ironclads, but the utter inability of wooden frigates, no matter how armed or commanded, to contend with them. It was the first contest between the new and the old systems, and left no uncertainty as to their relative merits. All maritime nations addressed themselves actively to the transformation of their old wooden steamships, wherever they were sound, by cutting down and plating their sides, and to supplying themselves with ships built according to the new system. The English displayed extraordinary activity in this direction; public opinion forced the government to build monitors as well as ironclad frigates; also to employ the best talents the country afforded in improving her system of artillery, as well as in experimenting upon the best combinations, whether of iron or of wood, for constructing impenetrable armor. Mr. E. J. Reed, secretary of the society of naval architects, was called to the post of chief constructor, and began at once a radical modification of the English naval marine. In 1863 the Bellerophon, representing the ideas which Mr. Reed had carried into the English admiralty, was put upon the stocks. The Warrior and the earlier English ironclads were constructed with deep frames running in a longitudinal direction through the greater part of the ship's hull, combined with numerous strong transverse frames, formed of plates and angle irons. In fact, up to the height of the armor, the longitudinal framing of the older ironclads closely resembles that of the roadway of a common English girder bridge of iron, in which the principal or longitudinal strength is contributed by the continuous girders that stretch from pier to pier, and the transverse framing consists of short girders fitted between and fastened to the continuous girders. If such a structure be conceived to be curved transversely to a ship's shape, and the under side to be covered with iron plating, a fair idea will be had of the construction of the hull of the Warrior. If instead of this arrangement the continuous longitudinal girders be considerably deepened and the transverse girders be replaced by "bracket frames," and, after curving these to the ship's form, both the upper and lower side thereof be iron-plated, a correspondingly good idea will be had of the construction of the hull of the Bellerophon. In other words, the construction of the latter is identical with the cellular system of the Menai and other tubular bridges, which best combines lightness and strength in wrought-iron structures of tubular cross section. This double-skinned or tubular system, in addition to giving greater strength and safety than the single-skinned system, is also better adapted to resist the explosive effect of torpedoes, which are fast becoming one of the most important adjuncts to naval warfare. No ship's bottom can be made strong enough to resist the shock of a torpedo's explosion, and consequently Mr. Reed provided as far as possible against the danger of sinking by dividing his ships into water-tight compartments. Notwithstanding the superior strength and safety thus given to the Bellerophon, the weight of her hull was considerably less than it would have been if built of wood, and was very much less than the total weight of armor, armament, and equipment. In the wood-built ironclads the weight of hull was generally about equal to that of the total weight carried, and in the earlier built ironclads the hull was heavier than the cargo. In the Black Prince the weight of hull was 4,969 tons, and the total weight carried 4,281 tons. In the Bellerophon the hull, with thick skin plating and extra girders, was 3,652 tons, while the total weight carried was 3,798 tons. In the case of the Monarch, a turret ship built after this system, the weight of the hull is 3,674 tons, while the weight carried is 4,632 tons. In all the later ships constructed by Mr. Reed the carrying power is much greater than the weight of the hull, and is due mainly to the improved structural arrangements introduced by him. This system is known among naval constructors as the "bracket-plate system," and is now generally employed even by the private ship builders of England who build ships of war. - Iron-clad ships are substantially of two forms or types: those in which the batteries-are protected by armor laid upon the walls of the ships, such as the New Ironsides, Warrior, Hercules, and Bellerophon, and those carrying their batteries in turrets, such as the Miantonomoh, Monitor, Glatton, Thunderer, and Devastation; and they are divided into classes according to their uses for cruising, defending harbors, guarding coasts, or operating upon rivers and lakes. While there is a certain similarity in all the vessels of each class, there are also many differences in details, according to the intended use. The Warrior is armed only at the middle, with 4 1/2-inch plates, while both bow and stern, including the steering gear, are exposed to shot and shell. 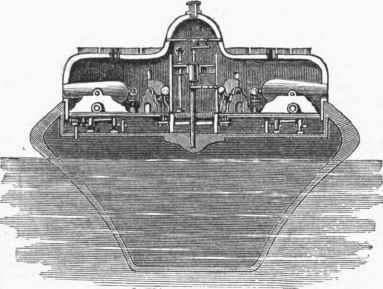 In all the more recent English ships this central battery or " box " has been enlarged by a continuous belt of armor extending from stem to stern, and protecting the region of the water line and steering gear. The Warrior's armor is of uniform thickness; but in recent ships the most vital parts, such as the region of the water line and over the machinery, have been further protected by thick armor, additional backing, and iron bulkheads fitted inside. The Warrior possesses only broadside fire; all the later vessels have their fighting capacity increased by bow and stern fire of greater or less extent. The Warrior has only her main-deck battery armor-plated; recent ships have a protected upper-deck battery. The Warrior has her guns well spread out; later ships carry their battery concentrated, and composed of much heavier guns. The Warrior was made extremely long with a view to speed; recent ships are much shorter in proportion, and are handled more easily. The Warrior has a single-skinned hull and comparatively light and weak framing; later ships are double-skinned, with deep, strong framing and water-tight compartments. The armor of the Warrior, as before stated, is only 4 1/2 in. thick; that of the Bellerophon is 6 in., of the Hercules 9 in., of the Hotspur 11 in., and that on the sides of the monitors Glatton, Thunderer, and Devastation is 12 in., while their turrets are 14 in. Presuming that the resistance offered by armor plates to penetration varies as the square of the thickness, which is approximately correct, the armory of the Bellerophon is nearly twice as strong as that of the Warrior, of the Hercules about seven times, of the Hotspur six times, of the Glatton seven times, and of the turrets of the latter nearly ten times. The guns (rifled) used by the Warrior weigh 4 3/4 tons, those of the Bellerophon 12 tons, of the Hercules 18 tons, of the Glatton 25 tons; while those of the Thunderer and Devastation weigh 30 tons. The necessity of carrying such armor and guns, and of firing ahead and astern, as well as from the broadside, has rendered essential many changes in the sizes, forms, and arrangements of the sides, decks, and batteries of armored ships. The introduction of twin screws, and the necessity of having light-draught vessels for coast and harbor defence, have also led to further differences. When the first English ironclads were constructed, the most powerful guns used by their ships of war were 68-pdrs. or 8-inch smooth-bore guns. The Americans then used 9- and 10-inch guns, and 4 1/2-inch armor plating was deemed sufficient when properly backed and supported. This thickness of armor backed in various ways forms the protection of a large number of the English and French ironclads. In the first iron ships, the Warrior, Black Prince, Achilles, Defence, Resistance, Hector, and Valiant, the 4 1/2-inch armor was backed by 18 in. of teak fitted outside the hulls; and in the wooden ships the armor was bolted on the outside of the planking. In the Minotaur class the plating was increased to 5 1/2 in., but the backing was reduced to 9 in., so that practically the sides of the latter class are of the same strength as those of the Warrior class. In the Belle-rophon the armor plating is 6 in. and the backing 10 in., but it is still further strengthened by having the skin plating 1 1/2 in. thick, or nearly an inch thicker than in the older iron-built vessels. The armor of sea-going broadside ships has, according to some English authorities, reached its greatest thickness in the Hercules, which has 9-inch armor at the water line, 8-inch on the most important parts of the broadside, and 6-inch on the remainder, with teak backing 10 and 12 in. thick outside the l 1/2 inch skin plating. Below the lower deck, and down to the lower edge of the armor, the spaces known as the "wing passages" are filled in with solid teak backing, inside of which there is an iron skin £ in. thick, supported by vertical frames 7 in. deep. The total protection in the region of the water line therefore consists of 11 1/4 in. of iron, of which 9 in. are in one thickness, and 40 in. teak backing. The trial of a target at Shoeburyness, constructed to represent this part of the ship's side, proved that it was virtually impenetrable to the 600-pdr. rifle gun. But the maximum thickness of armor carried must not be considered to have been yet attained. Coast-defence vessels and rams have been built to carry 11- and 12-inch armor, and ships have been designed and will doubtless be built for sea-going purposes to carry 15, 18, and 20 in. of armor, either in turrets or broadsides. Fig. 1. - Demologos (elevation). Fig. 2. - Demologos (section). Fig. 3. - The Devastation. Fig. 4. - The Gloire. Fig. 5. - The St. Louis. Fig. 6. - The Monitor (elevation). Fig. 7. - Timby's Revolving Turret. The weakest of English ironclads. But very slightly stronger than the above. All of equal strength to resist shot. The greater thickness of skin plating in this and most of the following ships is obviously equivalent to an increase in the thickness of armor. Armor only 5 in. thick on some parts of the broadside. These have 8-inch armor on the water-line belt. The Captain had 8-inch armor in the wake of the turret. An additional protection of about 30 in. of teak, backed by a 3/4-inch iron skin, in the "neighborhood of the water line. * These two ships have an inner skin of l 1/2-inch iron, and a strake of 5 1/2-inch armor at the water line, and the frame is filled in solid behind the armor; so that in addition to the outer and Inner armor, the whole thickness of the side is available to resist penetration. In all the other wooden ships water can enter when the outside planking, which is only 8 or 10 in. thick, is penetrated. 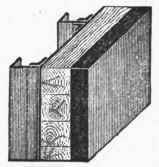 The information contained in the preceding summary of the English ironclads is illustrated in the accompanying engravings, showing specimen blocks cut from the sides of the ships which may be taken as fair representatives of the various classes. The section from the side of the Kalamazoo may be regarded as fairly representing the strongest class of American monitors. The latest publication concerning the English iron-clad navy (April, 1874) gives a list of 55 vessels, of which 41 are sea-going ships and 14 are available for harbor and coast defence. Of the sea-going ships 5 are in the course of construction, and 9 are not fit to go to sea, or worth making fit; and 9 more which are not yet available for service should also be deducted, leaving 18 now about ready. Of the 14 coast-defence ironclads, only 9 are fit for service; the other 5 are on foreign stations and said to be not worth taking home. The French ironclads Gloire, Magenta, and Sol-ferino have armor a little over 4 1/2 in. thick, worked upon ordinary wooden hulls. The iron-built frigate Couronne and the small wooden floating batteries of the Palestro class carry about the same thickness of armor. All the other floating batteries are iron-built and have 5 1/2-inch armor. The frigates of the Flan-dre class and the ram Taureau have armor a little less than 6 in. thick laid upon wooden hulls, while the corvettes and second-class frigates of the Alma class have armor 5 8/10 in. thick at the water line, and 4 and 4 8/10 in. on the other parts. The vessels of the Marengo class, corresponding very nearly to the English Invincible class, have 7 /8/10-inch armor at the water line, and from 4 to 6 1/5 in. on other parts. The rams of the Belier class have 7- and 8 1/5-inch armor. By far the greater number of the French ironclads are wood-built, the armor being simply laid upon the outside planking, without inner skin plating or longitudinal girders to give greater strength. They are therefore weaker than the English ships even when the armor and backing are equal. - In the American sea-going ironclads, what is known as laminated armor has been largely if not almost exclusively used. This was rendered necessary at first by the fact that thick armor plates could not be produced by the rolling mills in anything like sufficient quantities; but a few ships like the Roanoke and New Ironsides have been made with solid armor, the former having plates 5 1/2 in. thick and the latter 4 1/2 in. With this exception, the armor of our ironclads is made up of consecutive plates averaging 1 in. thick, but backed, as in some of the monitors, by armor stringers or plank armor of small breadth and moderate thickness. Experiments made by the English admiralty at Shoeburyness prove this laminated armor to be far inferior to solid armor in power of resistance, and that no amount of strengthening can compensate for the defects of the laminated system. The resistance of single armor plates, shown by direct experiment for all thicknesses up to 5 1/2 in. to vary as the square of the thickness, does not obtain in laminated armor. For example, a 4-inch solid plate would be 16 times as strong as a 1-inch plate, but would not be four times as strong as four 1-inch plates riveted together, although it would be much stronger than the laminated structure. Excluding the Roanoke and New Ironsides and the river ironclads, which leaves only the Monitor class, the armor of the American ironclads may be briefly summarized as follows: The original Monitor had her hull protected by five layers of 1-inch plate, diminishing first to 4 in. and then to 3 in. in thickness below the water line; her turret, as previously stated, was built of eight layers of 1-inch iron. The wood backing of the hull armor was 27 in. thick, bolted to 5/8 -inch iron skin plating. The Passaic class have armor of the same thickness as the first Monitor, but have 39 in. of wood backing. The Canonicus class have five layers of 1-inch plates, supported by two armor stringers let into 27 in. 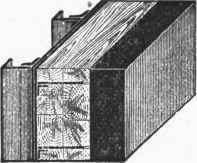 of wood backing; their turrets have 11 layers of 1-inch plates. The Miantonomoh and the Monadnock, which are wood-built, are protected much like the Canonicus. 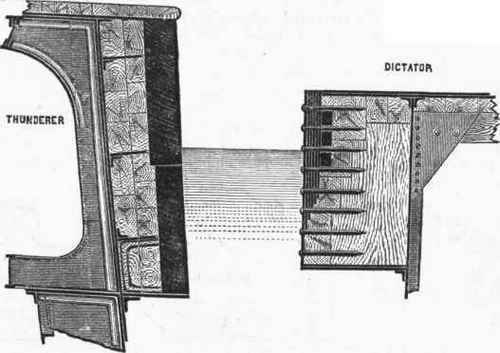 The Puritan and the Dictator have six layers of 1-inch plates on their sides, with 42 in. of wood backing; their turrets are 15 in. thick, made up of two drums, with segments of wrought-iron hoops 5 in. thick placed between the drums, which are composed of layers of 1-inch plates. In the Kalamazoo class the total thickness of hull armor is 6 in., made up of two layers of 3-inch plates, backed by 30 in. of oak, still further strengthened near the water line with three armor stringers, 8 in. square, let into the backing, and only a few inches apart. This is by far the most formidable armor carried by any of the American monitors; and while there are in some places 14 in. of iron, there is no part of it nearly so strong as it would be with that thickness in solid plates. The turrets of the Kalamazoo are 15 in. thick, like those of the Dictator, but none of them have any backing or wood about them. The rapid diminution in thickness of armor on these vessels is a serious defect, leaving no ground for comparison with corresponding English ships. The Dictator, for instance, 2 1/2 ft. below the water line, has but two 1-inch plates, and at 3 ft. only one. Fig. 8. - Sections of the Sides of Iron-clad Ships of the Various Classes. Fig. 9. - Sections of the Armor of the Thunderer and Dictator. - In the earlier English ironclads the armor extended over a portion of the broadside only, as in the case of the Warrior, whose length is 380 ft., and the armored portion only 213 ft., leaving the extremities of the ship entirely unprotected. At the ends of the armored portion iron-plated bulkheads are built across the ship, making with the side armor a central or "box " battery extending to a little more than 6 ft. below the water line. 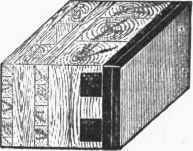 This box battery, or partial protection, is also adopted on the Black Prince, Defence, and Resistance, but has been modified by the addition of a belt of plating extending from the upper to the main decks, before and abaft the broadside armor, on the Hector and Valiant. The main deck on which the guns are fought is thus protected throughout its entire length, but the extremities between wind and water are quite unprotected. Both these plans of disposing the armor were considered unsatisfactory, and in the Minotaur and converted ships of the Caledonian class, the " complete protection system," in which the armor extends from stem to stern, and 6 ft. below the water line, was adopted. This system is followed in nearly all the monitors, both English and American, and in nearly all the French ships. The great development in the power of ordnance has led not only to increased thickness of armor, but to different modes of disposing it. In the Bellerophon and Hercules, and in other large English ships, an arrangement of the armor consisting of a middle course between the Warrior and Minotaur has been adopted. The Achilles, a ship of the Warrior class, had the water-line belt added. This plan of plating is known as the central battery and armor belt system. In this arrangement the great weight of the armor and battery is amidships, and the ends of the ship are not overloaded as in the complete protection system. An important modification of the method of applying the armor is shown in the engraving of the Invincible, by which the plating is continued up to such a height above the upper deck, amidships, as to protect four heavy guns mounted at the angles of an octagonal battery, of which the ends are closed by transverse iron-plated bulkheads. Previously to the design of this arrangement the Lord Clyde and Lord Warden were supplied with powerful armored bow batteries on the upper deck, but the arrangement of the Invincible has many advantages. In their recent ships the French have abandoned the complete protection system, and adopted the central battery and armor belt system, and generally follow the varieties of English practice. 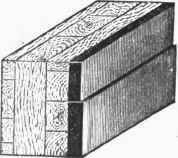 The American practice, as shown in the New Ironsides and Roanoke, is essentially the same as the central box or partial protection system. 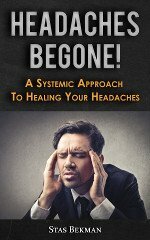 In the monitor system the practice has been sufficiently indicated. With the low freeboards of these vessels, the armor that would otherwise go upon the sides has to be spread upon the deck to prevent penetration by plunging and vertical fire, to which they are peculiarly liable. The English admiralty have designed an arrangement of armor which they apply to what they call "breastwork monitors." They resemble American monitors, in having their upper decks at comparatively small height above water; but instead of having these decks flush, except where the turrets, funnels, air shafts, and hatchway casings rise above the deck, they have a space amidships surrounded by an armored breastwork, which rises several feet above the deck, and encloses the parts just mentioned. By this means the height of the freeboard is'materially increased for a great part of the ship's length; the height of the turret parts above water is made much greater than is usual in American monitors; and the liability to serious injury, resulting from the perforation of the deck and funnels, and from heavy blows upon the base of the turrets, is much reduced. The Cerberus is a fair representation of the breastwork monitors. - The monitor or turret system possesses many advantages, but also under some circumstances so many disadvantages that its introduction has occasioned much diversity of opinion among naval officers and constructors throughout the world. The advantages are as follows: the facility with which large guns may be smoothly and easily trained, and with which the same guns may be used in all directions; the small size of the ports, and the difficulty of hitting them; the low freeboard, and consequently small target offered to the enemy's fire; the great thickness which may be given to the armor, and the great size and penetrating power which may be given to the few guns protected by it. As fighting ships, there is no reason why the monitors may not be made superior to any other form of ironclad yet invented. The only serious defect which has been developed in their fighting power is the liability of the turret as originally constructed to become jammed by being struck at or near the junction with the deck, so that it will not revolve. 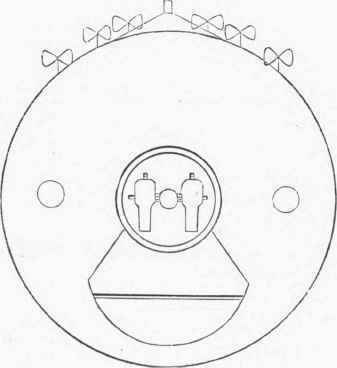 This defect has been partially remedied by the use of a massive ring of iron, surrounding the base of the turret, and by the breastwork system. 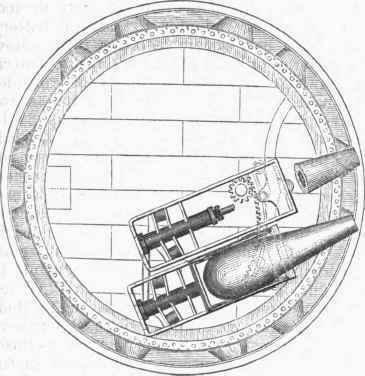 A still better remedy has been introduced by James B. Eads, C. E., of St. Louis, who constructed stationary turrets and arranged the guns so that they might be, traversed in pairs, as shown in fig. 17. The greatest defect in this system is that ships constructed after the original Monitor model are poorly adapted for sea-going purposes, and hence cannot be made first-class cruisers. This opinion is not controverted by the fact that the Miantonomoh and similar ships have crossed the ocean in various directions. It is now generally admitted that no monitor, with turrets standing upon the low deck, unprotected by breastworks, with hatchways, air shafts, and low turret tops opening through her deck only two or three feet above the water line, can be considered as a satisfactory sea-going vessel. On the other hand, with such improvements as have been or may hereafter be made, this class of ships are and will probably remain unrivalled for harbor and coast defence, and for use against land batteries and fortifications, and may ultimately be made to serve successfully as cruisers. Fig. 15. - Lord Clyde. Fig. 17. - Eads's Revolving Battery. Fig. I8. - Russian Circular Monitor, Elevation and Deck. North and Black seas. These batteries are called Popoffka, and are about 100 ft. in diameter, bordered with wood and lined with copper, after the system followed in the construction of the Raleigh in England. Their draught is about 12 ft., height of upper deck above water about 2 ft., and displacement about 2,530 tons. Their stability in the water is secured by 12 keels. The middle of the vessels is surmounted by a turret 30 ft. in diameter and 7 ft. high, carrying two steel 11-ton 8-inch breech-loading rifles. The lower part of the hull is double-skinned, the outer skin being about 1/2 in. thick, and the inner one 1/4 in. The space between is about 3 ft. and divided into water-tight compartments. They are propelled by six separate engines and screws, each working up to 80 horse power. Their speed is about 9 knots per hour; complements of officers 11, men 85 to 90. The hull armor is composed of two strakes of plates each 2 1/2 ft. wide, the upper one about 9 in. thick and the lower about 7 in., backed by 7 and 9 in. of teak respectively. The turrets are constructed in the same manner, but the plates are 9 in thick throughout. This system seems to he capable of great expansion as affording the means of constructing batteries practically indestructible, and capable of carrying any weight of armor or armament. - The offensive powers of ironclads, in common with those of other ships of war, are measured by the number and power of their guns, the rapidity with which they may be loaded and fired, and the facility with which they may command all points within range. The wooden frigates of the English navy in use before the construction of ironclads carried 32-pdrs. and 68-pdrs. ; while the Americans used 42s, 64s, and 9- and 10-inch Dahlgren smooth-bore shell guns, which at the outbreak of the civil war they increased to 11-inch guns. Subsequently they adopted 13- and 15-inch iron guns of the Dahlgren model, cast after the Rodman process, the 15-inch guns throwing solid shot weighing 450 lbs., with a charge of 60 lbs. It is now proposed to make and use on the monitors 20-inch guns throwing shot weighing 1,080 lbs., with a charge of powder weighing from 120 to 250 lbs. It is thought to be practicable to construct and use even 25- or 30-inch guns of this model. This system is based upon the idea of a heavy projectile of large size moving at comparatively low velocity, instead of an elongated projectile moving at a high velocity, and is termed the " racking or battering " system, in contradistinction to the English "punching system," based upon the use of rifle guns throwing large elongated shot at higher velocities. The latter, instead of using the 68-pdr. (8-inch) gun, which failed to penetrate the Warrior's armor at 200 yards, now use 6 1/2-ton rifle guns, which would pierce it at 500 yards, 12- and 18-ton guns, which would do the same at 2,000 and 3,000 yards, and 25-ton guns, which would probably penetrate any ironclad afloat, except perhaps the Hercules, at 4,000 yards. They have made and will use on the Thunderer and Devastation 30-ton rifles, throwing shot weighing 600 lbs. They contemplate the construction and use at an early day of 70- and 80-ton rifles, and ultimately will doubtless construct them of still greater weights and power. The projectile of the 6 1/2-ton guns is 7 in. in diameter and weighs 115 lbs., taking a charge of 22 lbs. ; that of the 12-ton gun is 9 in. in diameter, weighs 250 lbs., and is fired with 43 lbs. of powder; that of the 18-ton gun is 10 in. in diameter, weighs 400 lbs., and is fired with 60 lbs. of powder; while those for the 25- and 30-ton guns are 12 in. in diameter, weigh 600 lbs., and are fired with 70 lbs. and 100 lbs. of powder respectively. Great differences of opinion prevail with reference to the merits of these two systems, but experiments made by the English seem to fairly indicate the superiority of the punching system. They show, for instance, that the 15-inch smooth-bore gun, throwing a spherical solid shot weighing 484 lbs., with a charge of 50 lbs. of English powder (said to be equal to 60 lbs. of American powder), would fail to penetrate the Lord Warden's side (see fig. 8) at any range, while the English 9-inch 12-ton gun, within elongated shot weighing 250 lbs. and a 43-lb. charge, would penetrate her at 1,000 yards. They also show that the 15-inch smooth-bore gun would not penetrate the Warrior at a greater range than 500 yards, while the 7-inch 6 1/2-ton rifle, weighing 'only about one third as much, would penetrate her at the same distance with a charge of 22 lbs. and a shot weighing 115 lbs. As a matter of course, the rifles of 12, 18, 25, and 30 tons would penetrate at correspondingly increased distances. On the other hand, there seems to be but little doubt that the American guns have greater battering power; the real question at issue is as to the relative merits of penetration and battering or racking. The English and the French prefer the former, and for apparently sound reasons, while the Americans as yet prefer the latter and point to the experience of the civil war in vindication of their opinion. But it must not be forgotten that the ironclads disabled or captured by them from the confederates were hastily constructed and poorly armored, and carried light guns in comparison with those of the well built and strongly armored ships of the European navies. The advocates of the racking system lay particular stress upon the "smashing" of the sides of the casemated ship Atlanta by the 15-inch shot of the monitor Weehawken, at a range of 300 yards; but the Atlanta was not a first-class ship in any respect. There is now but little doubt that the United States government will be forced to abandon the racking system in its future vessels, or better still, to combine it with the punching system. - Iron-clad Earns. The introduction of steam men-of-war gave rise to numerous proposals for reviving the ancient method of naval warfare, that of disabling or sinking an enemy by ramming; and when the Gloire and the Warrior were built, their bows were designed, strengthened, and projected with this object in view. In all succeeding ironclads more or less efficient provisions have been made to adapt the bows to the same purpose. In the American navy a special class of small swift river steamers were fitted up specially for this purpose during the civil war. 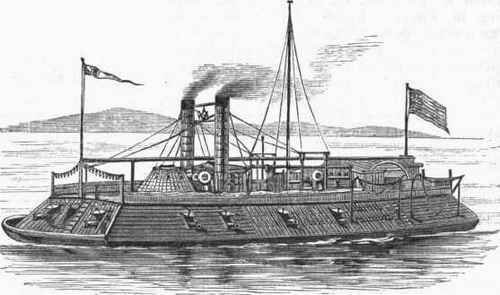 The confederates built several extraordinary crafts of this class, designed specially for harbor defence, among the most notable of which was the Merrimack already mentioned. Most if not all of the monitors were also strengthened for ramming, and several of the engagements, particularly those on the Mississippi, were greatly influenced if not decided by ramming. The French and English followed the example of the Americans, and at the end of the war they had generally adopted the opinion of our naval officers that "every ironclad should be an unexceptionable ram; in other words, susceptible herself of being used as a projectile." The victory of the Austrian over the Italian fleet at Lissa in 1866 was in a great measure due to the excellent services of the Austrian ship Ferdinand Max, which rammed and sunk the American-built frigate Re d'ltalia and damaged other ships severely. It afforded conclusive evidence of the great results which may be achieved by the proper use of this method of attack, and attracted renewed attention to the construction and manoeuvring of iron-clad rams. In order that a ship may be efficient as a ram, it is obvious that she should be swift and handy under steam, so as to enable her not only to overtake her enemy, but to hit her directly and squarely in the side. These qualities are incompatible with either great size or great length. Hence the ram should have moderate dimensions and proportions, in combination with powerful machinery, twin screws, and improved means of steering. As to the proper form of ram bows, there are some differences of opinion among naval constructors. Some favor stems reaching forward above water, others prefer upright or nearly upright stems; but the majority are decidedly in favor of the under-water prow, spur, or eperon, which has been generally adopted in European navies. The advocates of the forward-reaching stem, like that shown in the Warrior, think that there is an advantage in delivering the blow above water rather than under, particularly in ramming low-decked monitors or ships with low sides, on the ground that there is a probability of overrunning the enemy and making the weight of the ramming ship aid in sinking her. Fig. 19. - Deck of Russian Circular Monitor. - See "Ordnance and Armor," by A. L. Hol-ley (New York, 1865); "History of the Navy during the Rebellion," by the Rev. C. B, Boyn-ton (New York, 1867-'8); "System of Naval Defences," by James B. Eads (New York, 1868); "Our Iron-clad Ships," and "Ship Building in Iron and Steel," by E. J. Reed (London, 1869); L'Art naval d l'exposition universelle de Paris en 1867, by Vice Admiral Edmond Paris (Paris, 1869); " Reports of the Committee appointed by the Lords Commissioners of the Admiralty to examine the Designs upon which Ships of War have recently been constructed " (London, 1872); La marine cuirassee, by M. P. Dislere (Paris, 1873); and reports of the secretary of the navy.